If you’ve been looking to set up a home gym, you’ve probably stumbled across Fringe Sport. If not, it’s about time you became familiar with them. After all they are the self proclaimed official suppliers to the home gym movement. 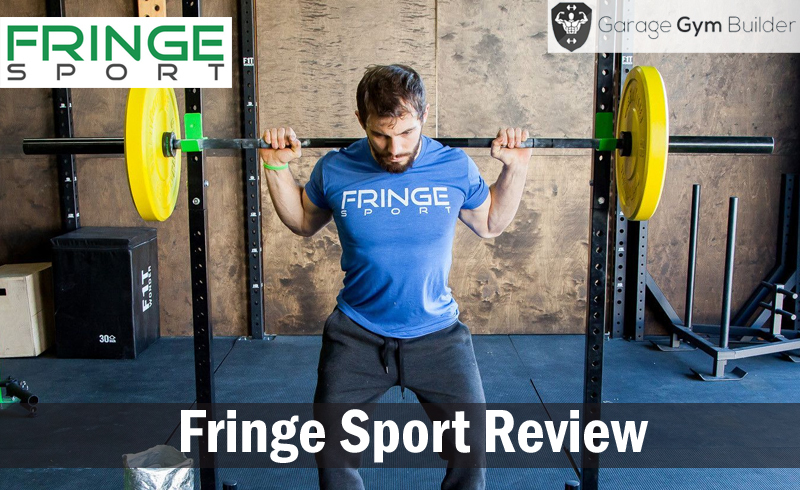 In this article, we get you up close with Fringe Sport as we delve into the company and the products and deals that they offer. Fringe Sport have been around since 2013. Everyone who works at the company is a committed fitness junkie. That means that they don’t sell anything that they don’t all love and use. Fringe’s mission is simple - when you buy something you keep coming back. That means that their focus isn’t just on selling you a product, but on providing you with a level of service and customer satisfaction that exceeds your expectations. All of the products sold by Fringe Sport come with a 365 day guarantee. They will even reimburse you for the cost of sending the product back to them during the first 45 days after purchase. Every Fringe Sport member is an active and knowledgeable lifter. They are always ready and willing to answer your questions, not only about the product you are buying, but about any aspect of the workout lifestyle. Fringe only work with suppliers who have the same commitment to quality and safety standards as they and their customers demand. You can have confidence that if you buy it from Fringe, it will be a premium quality product. To help you achieve your health and fitness goals by supplying the gear you need at a great price, with fast fulfillment and industry leading customer service. To transform Austin, Texas (their home) into a world renowned and internationally known mecca for physical fitness and physical culture. Fringe Sport offer international shipping on many of their products, so, regardless of where you are in the world, you have access to their product range. If you have a Crossfit or weightlifting event coming up, Fringe Sport are here to help. They offer equipment hireage. If your event is the in the Austin area, they’ll even deliver the gear to the site. They even offer prize packs for events! Fringe love to showcase the garage gyms that have been built using their equipment. As a result, they regularly feature home gym profiles on their blog. Just flick an email to [email protected] with the subject line ‘My Garage Gym. Fringe Sport operate out of a 5500 square foot warehouse in Austin, Texas. If you’re ever in the area they offer an open invitation to come on in and take a tour for yourself! They also sell a range of technique, or Tech, plates, which are the forerunners to bumper plates. Tech plates are weight plates constructed of plastic that have a 17-18" diameter (there is a bit of variation between brands). They typically are not made in weights higher than 25#/10kg. While they absorb the impact of a drop, they don't bounce like bumpers do- and they tend to be loud on the drop. Durability of tech plates is a strong point, but don't believe anyone who claims they're unbreakable. Fringe often run discounts of between 10-30% on their bumper and tech plates. In terms of metal plates, Fringe Sport offer a full complement of steel plates and fractional plates available. As well as standard metal plates they also offer premium plates. These are high-grade machined plates with rich baked black enamel paint are made from ASTM Grade 20 cast iron and are designed to fit on all 2" bars and shafts. The deep dish rim design allows the user to handle the plates easily.These Olympic plates are machined on rims and center to maintain a 2% accuracy level, plus or minus. Fringe supply a range of barbells to suit every level of training. Most of their bars come in weights of 20 kg for men and 15 kg for women. The "women's" bar features a 25mm shaft diameter vs. the "men's" 20kg and 28-32mm shaft. Fringe Sport manufacture their own barbells. The Bomba Barbell V2 is an enhanced version of their best selling barbell. This is now the best value American-made all-around training barbell you can get. After selling thousands of Bomba Bars, Fringe have listened to the customer feedback and incorporated it in the V2. They’ve now knurled the bar all the way to the collars, and knocked down the width of the "shoulder" on the collars, giving you more loadable area on the bar. They have also increased the steel PSI to 206,000 PSI, making this one of the strongest barbells you can buy. This product comes with a lifetime warranty against bending or breaking the shaft! Fringe Sport offer an impressive range of squat racks. Their range includes racks with pull up bars, those that incorporate a power rack and even one that includes a strongman yoke. Most racks are constructed of 2" x 2" powder coated 12-gauge and 14-gauge steel tubing with 3/4" Hole Diameter.The majority of fringe squat racks have floor-mounted weight horns built in for rock-solid stability and plate storage. They can also be bolted to the floor as a more permanent option for stability. Fringe offer a full complement of both indoor and outdoor rigs that allow for multi users on compound movements like squats, deadlifts and pull ups. Their 3 foot X 3 foot foundation rig features beefy 11-gauge steel with a 3"x3" cross section for the ultimate in sturdiness. This is a wall mount rig- it's a great way to get a lot of pull-up stations and a few squat stations in, while staying on a budget or installing a rig where space is tight. Plus, the rig comes standard with muscle-up bars, and super stable UHMW lined j-cups. Fringe Sport offer five workout benches, including an F/I/D multi-bench, which provides 7 Adjustable back positions - 15° increments 0° - 90°, 4 Adjustable seat positions - 15° increments 0° - 45°, a 3.75" Thick Bench with 1.5" of that firm foam padding and convenient handle and wheels make it easy to move around your garage or gym. Fringe Sport are the exclusive stockists of the Vaughn Weightlifting line of equipment. The Vaughn Weightlifting Equipment line was developed in conjunction with Chad Vaughn, the two-time Olympian and current clean and jerk American National Champion. He wanted durable, affordable Olympic equipment for training, and that's exactly what this is. Fringe have a men's and women's barbell, competition bumper plates in pounds and kilograms, as well as shirts and tanks. Fringe Sport have a full complement of bodyweight training equipment. Their range of strength resistance bands are an incredibly versatile tool for adding resistance to stretching, lifting, and bodyweight training exercises. A higher quality band does not exist. Ideal for assisted pull ups and dips. All bands are made of 100% natural latex through a continuous layering process to ensure long life. All bands are 41" in length and 3/16" thick. Seven different widths provide a range of resistance levels. Climbing ropes and battle ropes have become a popular bodyweight training option on recent years. Fringe Sports Bomba Climbing ropes are made with pride in the U.S.A. and are clamped with care to ensure they are beyond safe. They are Grade A 1 1/2" Manila, which means they will handle any and everything you throw at them and more. Manila also means that you don't have to worry about the rope getting sweaty or hard to grip, preventing athletes from slipping - it is the best climbing rope material, providing you with 16,000 lb breaking strength, a great natural grip and features an easy to use metal clamp. Fringe have a good range of glute hamstring developer (GHD) machines. Their standard model is small and mighty, perfect for boxes and garages alike. The compact size is perfect if you are tight on space, 30" x 51" foot print and 39.5" tall. Fixed rods at the front bottom to attach strength bands for added resistance. The compact design is perfect for tighter spaces and makes it incredibly sturdy, features a dense 20" wide pad, 6" at its highest. And it provides an adjustable distance from the foot plate to the pad, 16" at its closest and 26" at its furthest. Fringe also offer a range of pull up bars, parallettes and weight vests to complement your bodyweight training. The Fringe range of conditioning equipment is designed to help build muscle endurance, flexibility and reduce the risk of injury. Their conditioning line includes kettlebells, medicine balls, slam balls, plyo boxes, jump ropes, dumbbells, sleds and sandbag trainers. Fringe kettlebells feature a custom textured finish that provides superior grip without hurting your hands. The wide handle easily fits two hands, which is extremely helpful for kettlebell swings and any kettlebell workout. The Fringe website More Equipment category covers all those accessory items that you love, including apparel, recovery and mobility devices, and equipment for kids. Their OSO Mini Bar is a perfect fit for your littlest ones and 15lb Training Bar gets the older kids started, practicing their technique and perfecting their form. Any of their bumper plates can be added to these two bars so kids can train with mom and dad. The Fringe range of product packages are the best place to go to find a great bargain and save some serious cash. An example of this is the barbell and black Bumper Plate package. Fringe offer a full range of training apparel that is designed to help you blast through workouts. Designed for comfort, style and performance, we know it'll look good on you. The shirts are made from a poly blend so they are incredibly soft and feel great if you're working out or just hanging out. Fringe Sport aim to be the premium provider of training equipment and accessories for all training applications. As you can see from the overview provided here, they cover the entire field with top quality products, many of them made in-house. They also provide a great level of after sales service and follow up. That makes checking out Fringe Sport a no brainer when it comes to finding the right gear for your home gym.